While historic and modern sail-powered vessels converge on Duluth this month for the 2016 Tall Ships Duluth festival, ships first sailed the Great Lakes in 1679, when Robert Sieur de La Salle built a seventy-foot galliot (some considered it a brigantine) on Cayuga Creek on the Niagara River and named it the Griffon. Like other early Great Lakes vessels—brigantines, schooners, and sloops—the Griffon was modeled after traditional European designs. It was the first full-sized ship the lakes had seen, replacing the smaller, single-decked Frontenac, which LeSalle also built, which went down on Lake Ontario in January, 1679. The Griffon was built to help LaSalle find the fabled Northwest Passage to the Pacific Ocean. The forty-five-ton vessel was armed with seven cannons. Its maiden voyage carried LaSalle and Father Lewis Hennepin all the way to Green Bay, Wisconsin, but never went beyond Lake Michigan. LaSalle sent it back to Niagara loaded with furs in September of that year, but it vanished before reaching Lake Huron. It would be another 55 years before a tall ship would sail on Lake Superior. Until Louis Denis Monsieur de LaRonde arrived at Saulte St. Marie nearly midway through the eighteenth century, shipping traffic on Lake Superior was limited to canoes and barge-like batteauxs, flat-bottomed vessels propelled by a single sail that worked well on rivers and was used by both native tribes and French voyageurs and missionaries. In 1734 de LaRonde established a ship building community along the St. Mary’s River at Point Aux Pins, six miles west of Saulte Ste. Marie in what was then known as New France (today it is both Michigan and Ontario). That year he built a twenty-five-ton vessel rigged with two sails, hoping to cash in on the copper mines he established at Ontonogan, Michigan, on the Upper Peninsula. But Michigan’s copper mines wouldn’t be functioning at a high enough capacity for another hundred years. In 1771, Alexander Henry and Alexander Baxter built another forty-ton ship at Point Aux Pins to once again exploit copper mining, but they were also too early for Michigan’s copper mining industry. Beginning in 1786 the Northwest Company, a fur trapping firm, built several forty- to sixty-ton schooners at Point Aux Pins named the Athabaska, the Otter, the Perseverance, the Fur Trader, the Invincible, and the Discovery. Two other North West ships, the Mink and the Recovery, were built at Fort William, Ontario. 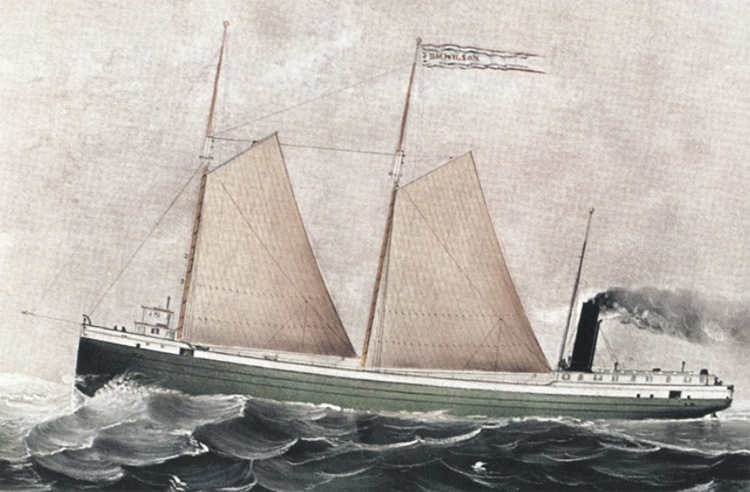 Following the War of 1812, during which they were used heavily, schooners became the Great Lakes vessels of choice. Most merchant ships built after the war and prior to 1830 were two-masted schooners. About seventy feet in length, each carried approximately 150 tons of cargo and required a crew of three or four men. Beginning in the 1830s brigantines—similar to schooners but with slightly different rigging—became popular, remaining so until about 1850. But they proved difficult to maneuver and required a crew twice the size of a schooner’s, so they were too expensive to operate at a profit. As the fur trade declined, some of these vessels were dismantled or moved to one of the lower lakes. 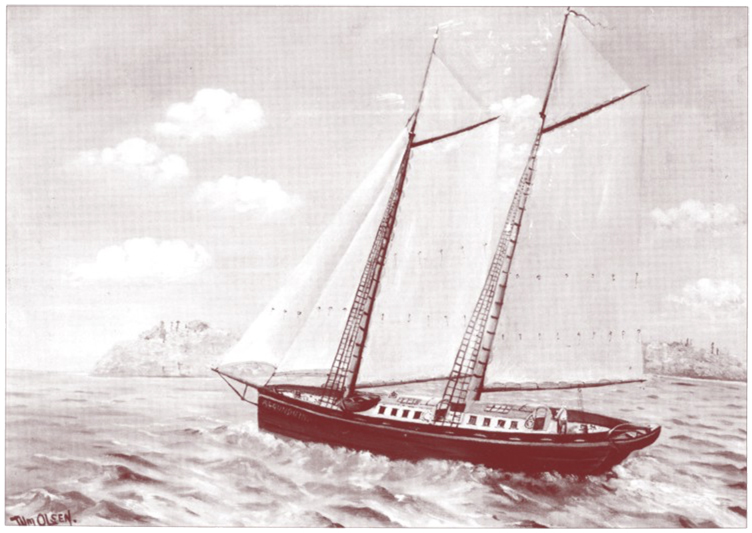 John Jacob Astor’s American Fur Company tried its hand at fishing Lake Superior, building the 111-ton schooner John Jacob Astor at Point Aux Pins in 1835 to transport fish and supplies. The firm added two more vessels over the next few years, the Madeline and the William Brewster (the latter was constructed at La Pointe on Madeline Island in the Apostle Islands). The Hudson’s Bay Company also tried its hand at commercial fishing, launching the Whitefish in 1836 and later portaging the Mary Elisabeth around the falls of the St. Mary’s River to Lake Superior. The catch was impressive, but the market for fresh fish was small—and then disappeared after the 1837 financial panic. The fur company gave up on fishing before 1840. The Astor, considered the first American commercial vessel to sail Lake Superior, sank September 21, 1844, at the Superior Fort Williams dock in Copper Harbor, Michigan.